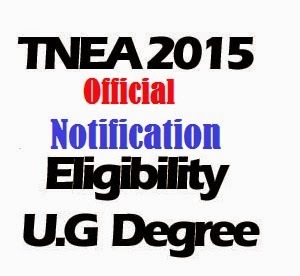 TNEA 2015 Official Notification along with TNEA Eligibility Criteria 2015 and Important Dates were going to be released by Anna University. Tamil Nadu Engineering Admission (TNEA) is the process through which close to 1.8 lakh engineering aspirants get themselves enrolled into engineering colleges of Tamil Nadu every year, through single window counselling process. Anna University has created a new official page for TNEA 2015. Students who wish to appear for TNEA 2015 may now access the official page of Anna University. Kicking off its preparations for the Tamil Nadu Engineering Admission (TNEA), Anna University has decided to begin the printing of applications for placement in the 570 colleges in the State. The decision was taken at the Counselling Coordination Committee meet on Tuesday. The dates for the counselling session will be decided at the next meeting of the committee to be held at the end of March or the beginning of April after consultation with the Election Commission, the Department of School Education and the Directorate of Medical Education. Candidates satisfying the following eligibility rules as on last date of submission of application are eligible to apply. Passing the qualifying examination or changing the religion etc. after this date shall not be considered. i) Tamil Nadu Native candidates who have studied VIII, IX, X, XI & XII Std. including Diploma in Tamil Nadu, need not enclose the "Nativity Certificate". ii) Candidates who have passed any of the VIII, IX, X, XI & XII Std. or their equivalent Examination from schools situated outside Tamil Nadu, should enclose a copy of the "Nativity Certificate" (vide certificate No. I) with the application for considering them as candidates belonging to Tamil Nadu. iii) Applications without proper Nativity Certificate for item 3.1 (A) (ii) will not be considered. i) Other State candidates who have studied VIII, IX, X, XI & XII Std. in Tamil Nadu, need not enclose the "Nativity Certificate". ii) Children of Central Government Employees otherwise not domicile of Tamil Nadu may also apply for admission, irrespective of their domicile, provided their parents or guardians (only if both parents are not alive) have been serving in Tamil Nadu continuously for the past FIVE YEARS at the time of submission of application which should be supported by enclosing a certificate from the employer of the parent or guardian, to that effect. iii) Sons / daughters of All India Service Tamil Nadu cadre Officers otherwise not native of Tamil Nadu are eligible. iv) Children of Employees in Public Sector or Government recognised Institutions who at the time of submission of application for admission employed in Tamil Nadu continuously for the past five years may also apply, irrespective of their domicile, provided a certificate from the employer is enclosed along with the application that the person is a Permanent Employee of the Firm or Institution concerned with evidence like Income Tax return, PF Slip, etc. and is working in Tamil Nadu continuously for the past FIVE YEARS. (iv) mentioned above will not be considered. vi) The candidates mentioned in sub clause (i), (ii), (iii) and (iv) are eligible for Open Competition only. (ii) Those who have not registered in the refugee camp, they should submit passport and visa. (D) Foreign Nationals are not eligible. The candidates who have passed 10+2 or its equivalent examination with Mathematics as one of the subjects. (1) OC candidates should have secured not less than 50% marks in aggregate. The candidate who have passed 10+3 Diploma (any stream) recognised by Central / State Governments. (1) OC candidates should have secured not less than 50% marks in aggregate in all the semesters put together. (2) BC/ BCM / MBC & DNC / SC/ SCA / ST candidates should have secured not less than 45% marks in aggregate in all the semesters put together. (2) BC/ BCM, MBC & DNC, SC/SCA and ST candidates should have secured not less than 45% marks in aggregate in all the semesters put together. When the candidates produce Grade certificates, they have to produce actual marks also otherwise only the minimum marks applicable to the grades in the eligible subjects will be taken into account. For the purpose of calculation of marks in respect of sandwich Diploma candidates, the marks of all the other semesters in which there is no industrial training shall be considered for the purpose of calculating the marks for eligibility.